Now that Durga Pujo is knocking at the door and just like last two years, this year too I am away from home, I have already begun to miss the euphoria and excitement the countdown of puja incites in Kolkata, the very ambience overrun by a pujo pujo feeling. I am missing the roads chockablock with shoppers wrapping up their last minute pujo shopping, the clamor of haggling between buyers and sellers and last but not the least the exhilaration upon the purchase of new clothes. The madness of Durga Pujo in Kolkata in one word is beyond description, something one ought to experience first-hand. I have many memories connected to pujo starting from childhood days when me with my three cousins would venture out for pandal hopping with a meager amount of money handed in by the elders. The eldest of all, five years senior to me would play the role of chaperon overseeing our safety. We were strictly instructed by the elders to hover within the boundary of Behala, which is about few kilometers distance from our homes. Once or twice, however, the eldest cousin planning to check out the pujos of Kidderpore, a little faraway from our home, told us to keep the plan hush-hush from elders, which all the time save once got leaked to my parents through me, thanks to my elder brother who always getting a hint about our pujo plan would try messing it up by informing the elders if the plan went beyond the permissible course while he himself would go around with his buddies to all the nooks and corners of Kolkata for pandal hopping. 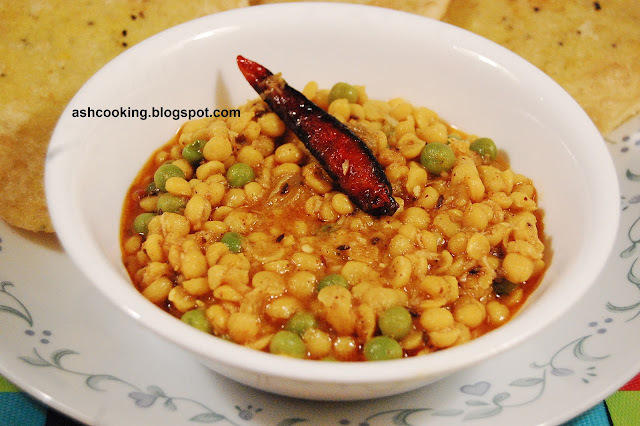 The following is a recipe of a very traditional cholar dal that is cooked without onion in a typical purist vegetarian fashion, offered as obeisance to the deity during Durga Pujo or Lokkhi Pujo. Among all the wholesome bhog items (offerings), if any that is consumed with unstinted appetite, next to bhoger khichuri, is cholar dal with luchi. I know many who literally would get into a fierce competition of outdoing each other in the number of luchis eaten during pujo, such is the frenzy luchi-cholar dal combination triggers. 2) Heat oil in a wok and when oil reaches a smoking point, add the ingredients for sauté and allow them to sputter. 3) Add chopped or grated coconut. Shallow fry. Add ginger paste, green chillies and stir around. 4) Pour the lentil in, add dry red chilli powder, hing powder, salt and frozen peas. Measure out 1/2 cup of water into it and cook covered for 5 minutes. 5) Add sugar, raisins, garam masala powder and ghee. Simmer for 2 more minutes before turning off the flame. 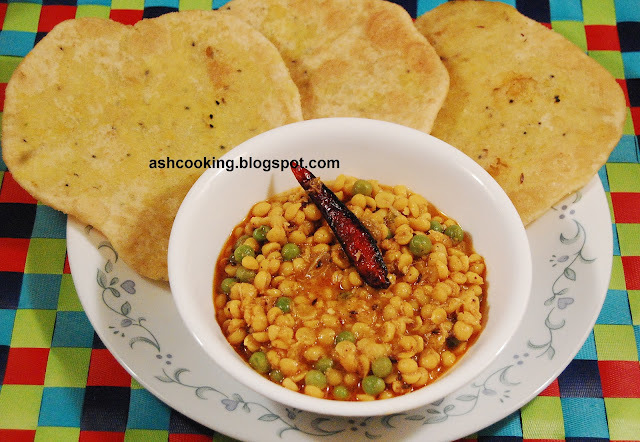 6) Serve hot with luchi, paratha or fried rice.